FCPO 3rd month June futures contract traded RM39 lower to close at RM2500 levels as compare to previous trading sessions with a total of 11,188 lots traded in the market. FCPO price was traded lower during trading sessions as crude oil and soybean oil were traded lower during electronic trading session. FCPO price rebounded 61.8% Fibonacci resistance level at RM2553 regions before start to plunge lower during trading sessions towards psychology lower at RM2500 regions. Technically, FCPO price affirm riding on minor wave 3 towards south next support levels were anticipated around RM2464 and RM2443; 100% and 123.6% Fibonacci support levels. However, FCPO price would encounter some degree of selling pressure around RM2520 and RM2530 regions in the case presume FCPO price rebound in the coming trading sessions. 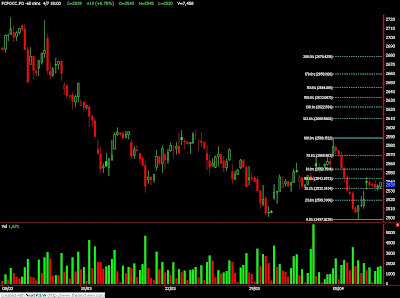 FKLI Apr Futures contract traded 11 point lower to close at 1332 levels as compare to previous trading session to with a total of 5,009 lots traded in the market. FKLI traded lower during trading sessions as regional indices and Dow Jones overnight, add electronic trading were traded weak during trading sessions. FKLI penetrate trend line support at 1340 upon open for trading and continue to trade lower during trading sessions to reach support levels at 1329.5 region; 61.8% and 178.6% Fibonacci support levels. Technically, FKLI seems temporary supported provided support levels at 1329 and 1313.5 were not violated in the coming trading sessions in order for uptrend to resume affirm. 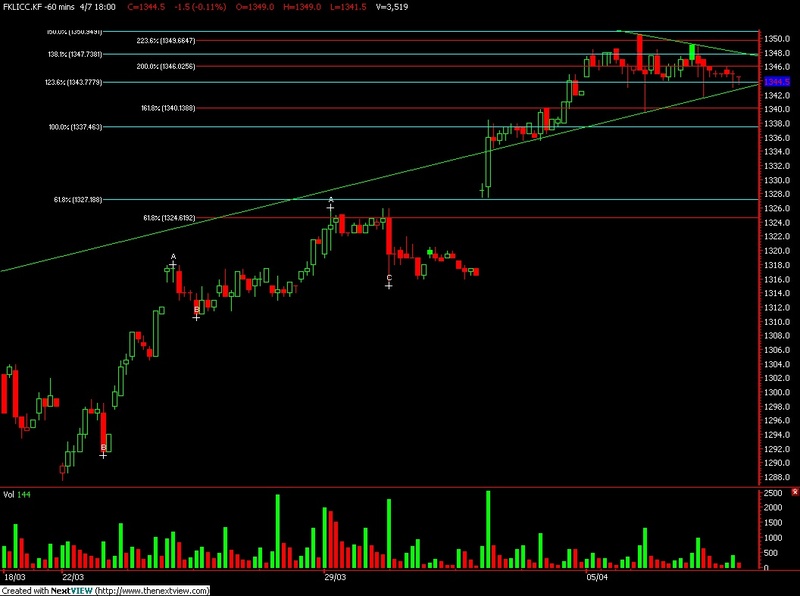 However, FKLI might challenge resistance levels at 1340 and 1353.5 regions in the coming trading sessions. April 8 (Bloomberg) -- Oil declined for a second day after a government report yesterday showed a bigger-than-forecast inventory gain in the U.S., the world’s largest energy consumer. Oil dropped as the Energy Department said crude supplies rose 1.98 million barrels to 356.2 million last week. Stockpiles were expected to climb by 1.35 million barrels, according to a Bloomberg News analyst survey. Machinery orders in Japan, the world’s third largest oil user, unexpectedly declined in February, raising concerns on future economic output. Crude oil for May delivery fell as much as 39 cents, or 0.5 percent, to $85.49 a barrel and was at $85.60 in electronic trading on the New York Mercantile Exchange at 9:35 a.m. Singapore time. Yesterday, the contract slipped 96 cents, or 1.1 percent, to settle at $85.88, dropping from an 18-month intraday high of $87.09 made April 6. Orders for factory equipment and items such as power generators, an indicator of business investment in three to six months, declined 5.4 percent from January, the Cabinet Office said today in Tokyo. The median estimate of 31 economists surveyed by Bloomberg was for a 3.7 percent gain. Oil also dropped as the dollar gained against the euro. A stronger U.S. currency reduces the investment appeal of commodities. The greenback fell 0.2 percent to $1.3318 per euro at 9:34 a.m. in Singapore after easing 0.4 percent yesterday. The euro fell against the dollar amid speculation Greece may default on its debt as early as this year, even as leaders tried to dispel fears the nation is unhappy with a bailout plan. Imports of crude oil last week gained 5.5 percent to 9.56 million barrels a day, the most since September, the Energy Department report showed. Fuel imports climbed 7.5 percent to 2.76 million barrels a day, the highest level since the week ended Feb. 5. Stockpiles of distillate fuel, a category that includes heating oil and diesel, increased 1.07 million barrels to 145.7 million, the first gain in 10 weeks. A 1.13 million-barrel drop was forecast, according to the median of 14 responses by analysts in the Bloomberg News survey. Gasoline supplies fell 2.5 million barrels to 222.4 million, the report showed. A 1 million-barrel decline was forecast. Refineries operated at 84.5 percent of capacity, the highest rate since the week ended Oct. 2. The gain in refinery operating rates has coincided with a drop in the profit margin, or crack spread, for refining crude. The profit from producing two barrels of gasoline and one of diesel fuel from three barrels of crude, the 3-2-1 crack, has dropped 12 percent to $10.44 a barrel today since reaching a high this year of $11.89 a barrel. Europe’s economy stagnated in the fourth quarter as companies cut spending. Gross domestic product in the 16-nation euro region remained unchanged compared with the third quarter, when it rose 0.4 percent, the European Union’s statistics office in Luxembourg said yesterday. It had previously reported a fourth-quarter expansion of 0.1 percent. Brent crude oil for May settlement fell as much as 40 cents, or 0.5 percent to $85.19 a barrel on the London-based ICE Futures Europe exchange. It was at $85.23 at 9:23 a.m. Singapore time. The contract fell 56 cents, or 0.7 percent, to end the session at $85.59 a barrel yesterday. April 7 (Bloomberg) -- Soybeans rose to a one-week high on speculation that China, the world’s biggest importer, will allow its currency to climb against the dollar, enhancing the allure of imports from the U.S. The Chinese yuan is trading close to the highest level in 11 weeks. The government may allow the currency to appreciate to limit the rate of inflation, which reached a 16-month high in February. U.S. Treasury Secretary Timothy F. Geithner will meet Chinese Vice Premier Wang Qishan tomorrow in Beijing. “There’s some buying tied to speculation that China will allow its currency to rise against the dollar and boost U.S. exports,” said Mark Schultz, the chief analyst for Northstar Commodity Investment Co. in Minneapolis. Soybean futures for May delivery rose 8 cents, or 0.8 percent, to $9.525 a bushel on the Chicago Board of Trade. Earlier, the price reached $9.57, the highest level for a most- active contract since March 31. The commodity has dropped 9.2 percent this year as rain improved prospects for record crops in Brazil and Argentina. Processors in China bought about 15 cargoes of soybeans last week as profit margins increased, three industry executives said. Orders averaged three to five cargoes a week in March, one executive said. Latin American will supply about half of last week’s purchases for shipment from May 1 to Sept. 30 with the rest from the U.S., the executives said. China may increase imports 3.4 percent to 42.5 million metric tons in the 12 months ending Sept. 30, the U.S. Department of Agriculture said last month. Imports have more than doubled in the past six years to meet domestic demand for animal feed and vegetable oil, USDA data show. Profit from processing imports has risen to more than 200 yuan ($29) a ton after domestic soybean-oil prices gained and the cost of beans from overseas fell, the China National Grain and Oils Information Center said today. The soybean crop in the U.S. was valued at $31.8 billion last year, second only to corn, government figures show. FCPO 3rd month June futures contract traded RM19 higher to close at RM2539 levels as compare to previous trading sessions with a total of 7,458 lots traded in the market. FCPO price was traded sideways during entire trading sessions despite huge price movement for crude oil and soybean oil were traded higher during overnight and electronic sessions. 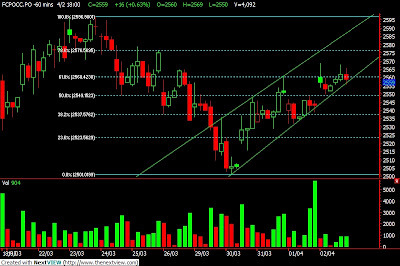 FCPO price manage to rebound 50% Fibonacci resistance levels at RM2542 regions but soon consolidate within range from RM2540 to RM2530 regions. Technically, FCPO price would anticipate into great price movement provided support levels at RM2530 and RM2510 failed to hold firm against selling pressure. However, FCPO price must not traded above resistance levels at RM2553 and RM2570 in order for correction phase to remain intact in FCPO trading direction. FKLI Apr Futures contract traded marginally 1.5 point lower to close at 1343 levels as compare to previous trading session to with a total of 3,519 lots traded in the market. Another sideways trading days for FKLI as regional indices were again traded mix during trading sessions. 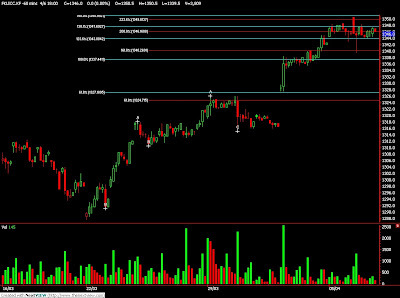 FKLI mainly consolidated within range from 1346 and 1344 regions during entire trading sessions. Technically, FKLI seems form a symmetric triangle in the hourly price chart where support trend line seen at 1341.5 while resistance trend line seen at 1350 regions. 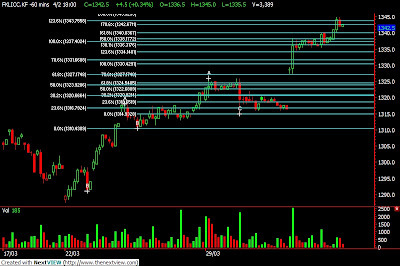 However, resistance level still seen at 1353 and 1359 regions based on wave count while support levels seen at 1340 and 1335 must not be violated in order uptrend to resume for short term trading. April 7 (Bloomberg) -- Crude oil traded near $87 a barrel in New York after rising on signs that U.S. economic growth will accelerate, bolstering fuel use in the world’s biggest energy- consuming country. Oil climbed above $87 for the first time since October 2008 yesterday on growth in American jobs and service industries. The U.S. government raised its 2010 oil price estimate on forecasts the global economy will rebound through the end of the year. Crude oil for May delivery was at $86.66 a barrel, down 18 cents, in electronic trading on the New York Mercantile Exchange at 8:58 a.m. Singapore time. Yesterday, the contract rose 22 cents, or 0.3 percent, to $86.84. Futures reached $87.09, the highest intraday level since Oct. 9, 2008. Federal Reserve officials saw signs of a strengthening recovery that could be hobbled by high unemployment and tight credit, and some warned of raising rates too soon, according to minutes of their March meeting. West Texas Intermediate oil, the U.S. benchmark, will average $80.74 a barrel this year, up from last month’s forecast of $80.06, according to the Energy Department’s monthly Short- Term Energy Outlook, released yesterday. That’s 31 percent higher than the 2009 average price of $61.66 a barrel. U.S. crude oil inventories rose by 1.07 million barrels last week to 353 million, the industry-funded American Petroleum Institute said yesterday. The government will probably say inventories rose 1.35 million barrels, according to the median of estimates in a Bloomberg News analyst survey before an Energy Department report today. Gasoline inventories fell 2.96 million barrels to 220.2 million, the API report showed. Supplies of distillate fuel, a category that includes heating oil and diesel, climbed by 723,000 barrels to 148.3 million. Supplies of gasoline probably dropped 1 million barrels from 224.9 million the prior week, the Bloomberg survey showed. Distillate stockpiles probably fell 1.13 million barrels from 144.6 million the prior week, according to the survey. The Energy Department is scheduled to release its weekly report at 10:30 a.m. in Washington. Brent crude oil for May settlement traded at $86.05 a barrel, down 10 cents, on London’s ICE Futures Europe exchange at 8:52 a.m. Singapore time. Yesterday, the contract increased 27 cents, or 0.3 percent, to end the session at $86.15. April 6 (Bloomberg) -- Soybeans rose the most in a week on speculation that an end to the global recession will boost demand for the oilseed to make food and animal feed. Economies will recover at various speeds, led by China and India, the Organization for Economic Cooperation and Development said. The Asian countries are the world’s biggest consumers of vegetable oil made from soybeans. U.S. payrolls in March rose the most since March 2007, signaling a rebound in the job market. Soybean futures for May delivery gained 8.5 cents, or 0.9 percent, to $9.445 a bushel on the Chicago Board of Trade, the biggest increase since March 29. The commodity has dropped 9.9 percent this year. On March 31, the price fell to $9.305, the lowest level for a most-active contract since March 16. “We held above last week’s low the past two days and that encouraged some short-covering” by speculators unwinding bets on lower prices, Hannagan said. The crop in the U.S. was valued at $31.8 billion last year, second only to corn, government figures show. The U.S. is the world’s biggest soybean exporter. April 6 (Bloomberg) -- Gold climbed to a one-month high, erasing a decline, as Greek debt concerns spurred investors to buy precious metals as an alternative to holding currency. Platinum touched a 20-month high before giving up the gain. Gold priced in euros is up 11 percent this year, reaching a record today as the 16-nation currency dropped against the dollar on concern the European Union’s financial-rescue plan for Greece may fail. Greek 10-year bond yields climbed above 7 percent for the first time since January. Gold futures for June delivery rose $2.20, or 0.2 percent, to $1,136 an ounce on the Comex in New York. Earlier, the most- active contract climbed to $1,139.60, the highest price since March 5. Bullion futures rallied 24 percent last year, touching a record $1,227.50 on Dec. 3, as U.S. interest rates held near zero sent the dollar down 4.2 percent against a basket of six major currencies. The dollar has gained 4.7 percent this year while gold is up 3.6 percent. The Reuters/Jefferies CRB Index of 19 commodities touched a 10-week high before erasing gains. Platinum futures for July delivery fell $5.30, or 0.3 percent, to $1,704.50 an ounce on the New York Mercantile Exchange. Earlier, the metal touched $1,713.20, the highest price for a most-active contract since Aug. 1, 2008. Silver futures for May delivery slipped 18.7 cents, or 1 percent, to $17.931 an ounce on the Comex. The metal gained 4.5 percent in the previous three sessions. June palladium futures advanced 50 cents, or 0.1 percent, to $508.50 an ounce on the Nymex. Before today, the metal surged 8 percent since March 30, touching a two-year high of $511.75 yesterday. April 7 (Bloomberg) -- The yen rose for a third day against the euro on concern a recovery in the 16-nation region will be hampered by discord over Greece’s rescue package, boosting demand for Japan’s currency as a refuge. The euro traded near its lowest since 1999 against Australia’s dollar before reports that may show European producer prices fell for a 14th month and German factory orders dropped. The yen strengthened against the greenback on speculation Federal Reserve Chairman Ben S. Bernanke will reiterate the central bank’s pledge to keep rates near zero to help sustain a recovery in the world’s largest economy. The yen rose to 125.36 per euro as of 9:19 a.m. in Tokyo from 125.67 in New York, when it gained by the most since Feb. 23. Japan’s currency traded at 93.70 per dollar from 93.79. The euro weakened to $1.3379 from $1.3399 in New York, when it fell as low as $1.3355, the least since March 26. FCPO 3rd month June futures contract traded RM10 lower to close at RM2520 levels as compare to previous trading sessions with a total of 11,697 lots traded in the market. FCPO price continue to trade lower during trading sessions despite crude oil and soybean oil surge during overnight trading sessions. 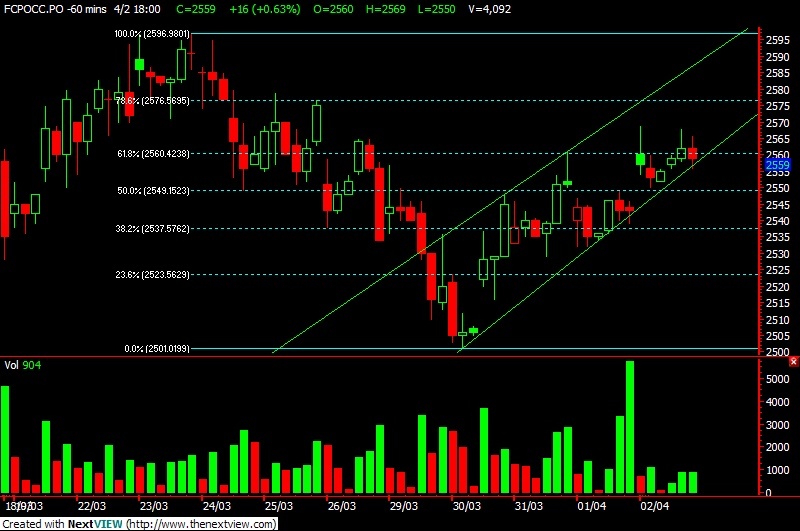 FCPO price false break below RM2500 support levels but recovered swiftly during trading sessions. Technically, FCPO price seems temporary supported provided support levels RM2500 and RM2480 were not violated during trading sessions. However, FCPO price seems temporary oversold in 5 min price chart where resistance levels seen at RM2532 and RM2542 regions. FKLI Apr Futures contract traded unchanged to close at 1346 levels as compare to previous trading session to with a total of 3,809 lots traded in the market. FKLI was traded sideways during entire trading sessions as regional indices were traded mix with Dow Jones futures electronic trading as well as Europe exchange in the 2nd trading sessions. 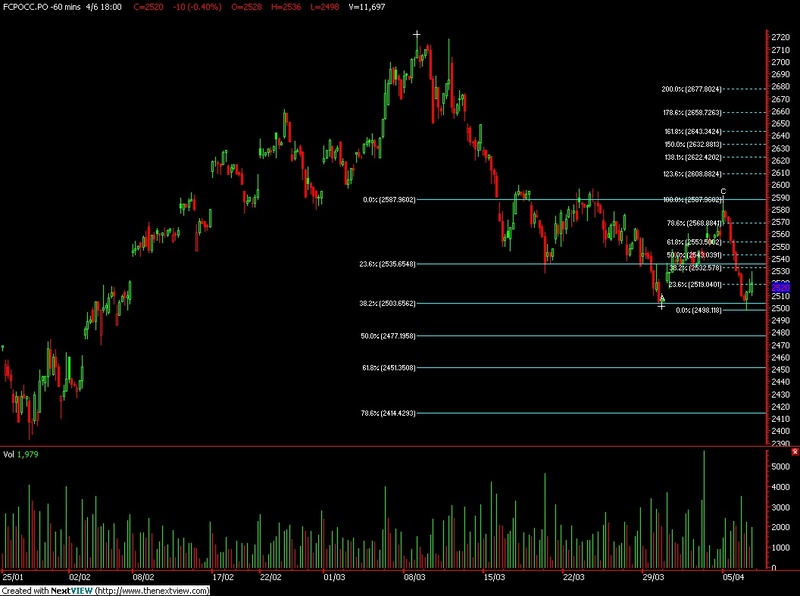 FKLI reach 150% Fibonacci resistance levels at 1351 regions before manage to penetrate lower towards 1340 regions but consolidate within 1344 and 1348 range after attempt to breach support levels at 1340 regions. Technically, FKLI has yet shown any sign on bearish despite hanging man bar appeared in the daily chart where further confirmation at 1340 and 1335 regions. 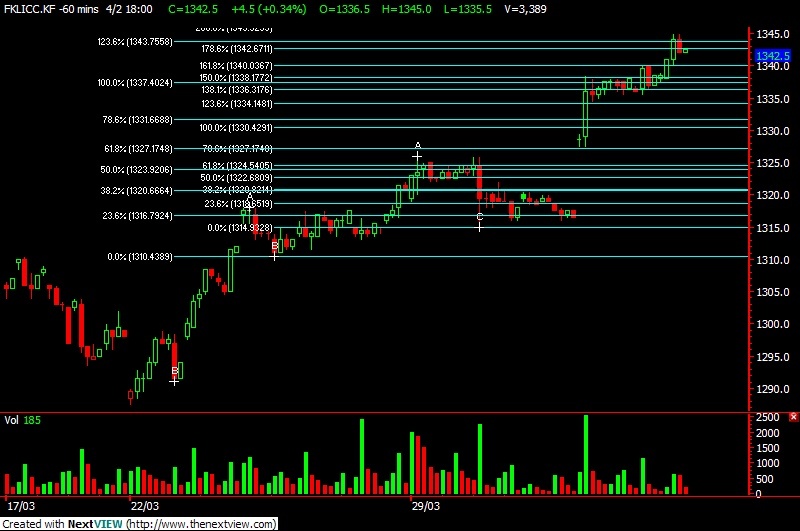 However, FKLI resistance levels were seen at 1353 and 1359 regions. FCPO 3rd month June futures contract traded RM29 lower to close at RM2530 levels as compare to previous trading sessions with a total of 10,422 lots traded in the market. FCPO price traded lower despite crude oil and soybean oil were traded higher during electronic trading during trading sessions. FCPO price reached 38.2% and 123.6% Fibonacci resistance levels at RM2584 regions since open for trading before plunge lower towards support levels at RM2530 regions. Technically, FCPO price seems complete wave 4 at RM2584 regions before wave 5 proceed trading south in the coming trading sessions. FCPO price wave 5 count provided resistance levels at RM2552 and RM2566; both were 38.1% and 61.8% Fibonacci were not violated in the coming trading sessions. 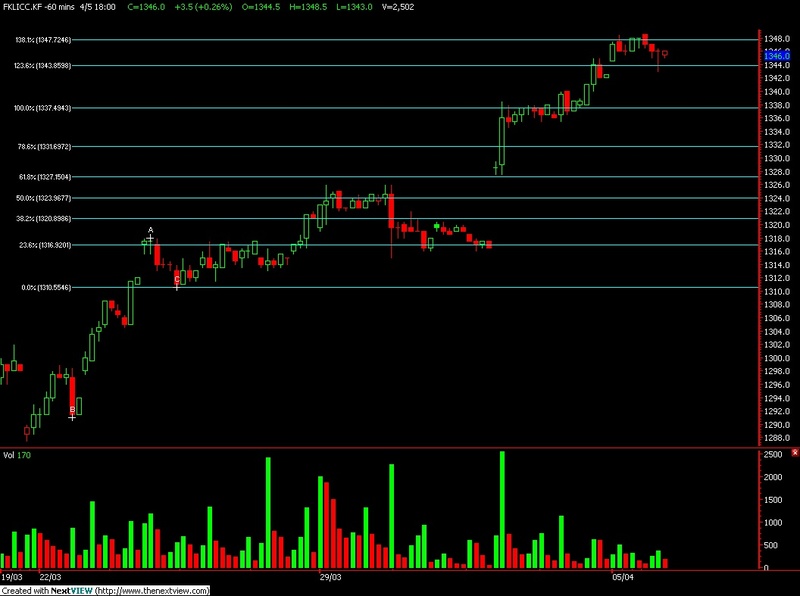 Support levels were seen at RM2530 and RM2500 regions. 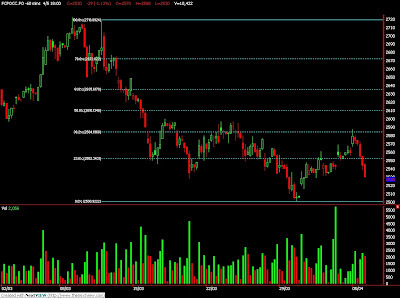 FKLI Apr Futures contract traded 3.5 point higher to close at 1346 levels as compare to previous trading session to with a total of 2,502 lots traded in the market. FKLI was traded sideways before end of trading sessions despite most of the regional indices were traded higher during trading sessions. 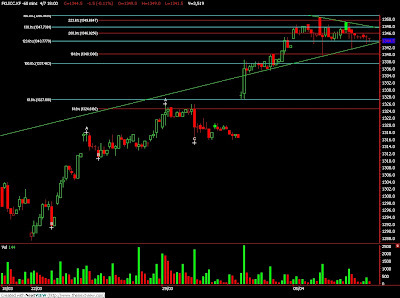 FKLI manage to penetrate previous resistance before reached 138.1% Fibonacci resistance level at 1348 regions. 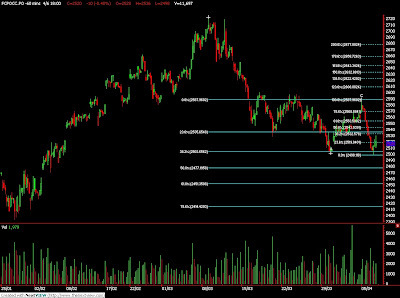 Technically, FKLI consolidate within range from 1345.5 and 1348.5 region before manage to break down lower to 1343.5; 38.1% Fibonacci support levels. FKLI yet appear any reversal signal provided support levels at 1340 and 1335.5 were not violated in the coming trading sessions. 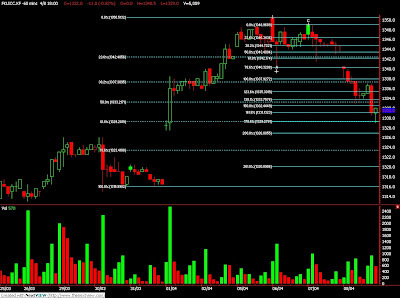 However, resistance levels were seen at 1349 and 1353.5 regions. FCPO June Futures contract traded RM16 higher as compare to previous trading sessions to close at RM2559 with a total of 4,092 lots traded in the market. FCPO price were trade mainly within range despite strong movement from soybean oil and crude oil overnight trading. 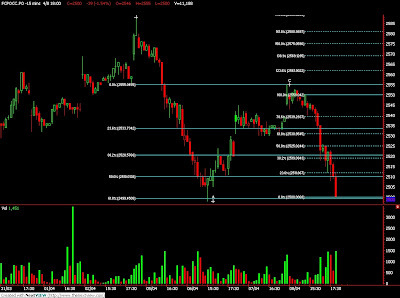 FCPO price were traded sideways within range from RM2550 and RM2565 regions. 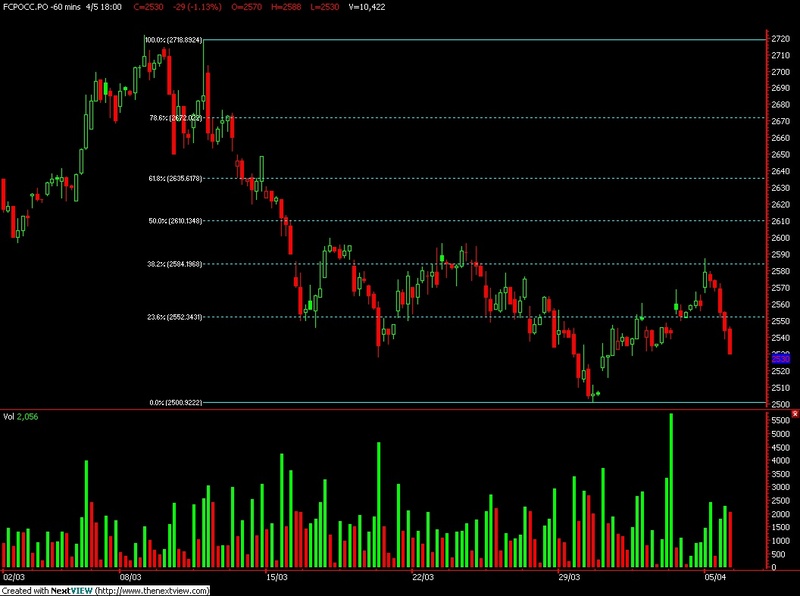 Technically, FCPO price attempted to test resistance levels at RM2580; 78.6% Fibonacci resistance levels, in the coming trading sessions. Failure to hold FCPO price below RM2580 and RM2606 regions shall indicates bullish sentiment in the coming trading sessions. However, failure to hold above support levels at RM2550 and RM2530 shall indicate further correction in FCPO trading. FKLI April Futures contract was traded 4.5 point higher as compare to previous trading session to close at 1342.5 levels with a total of 3,389 lots traded in the market. 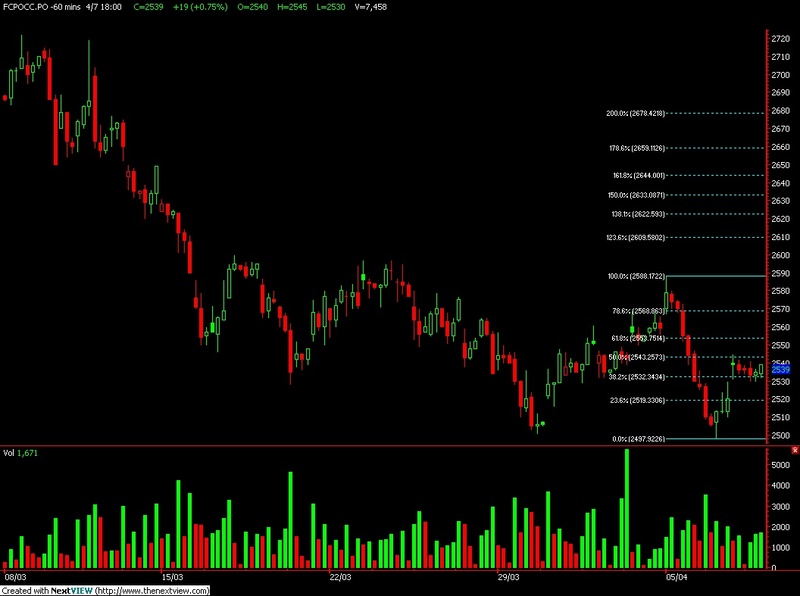 FKLI traded higher after long consolidate as regional indices were traded higher during trading sessions. 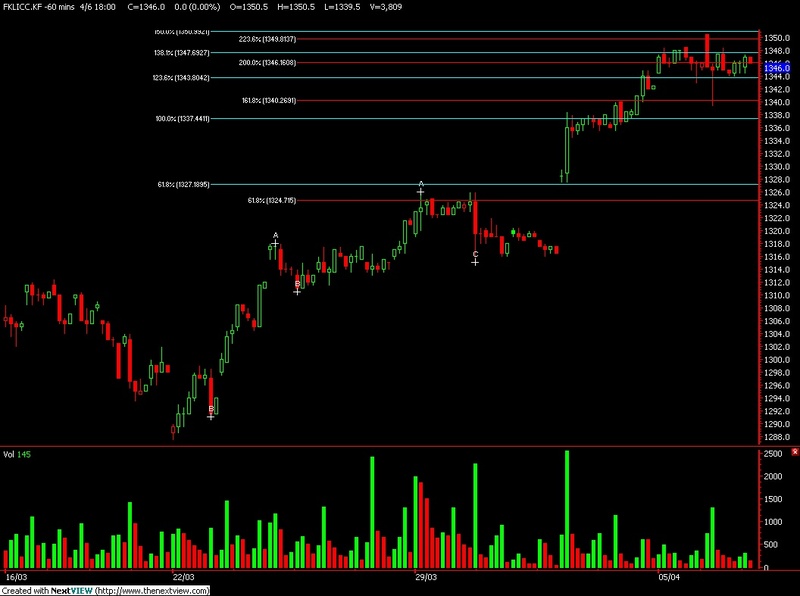 FKLI traded higher since break up from consolidation range from 1338 and 1335 regions. 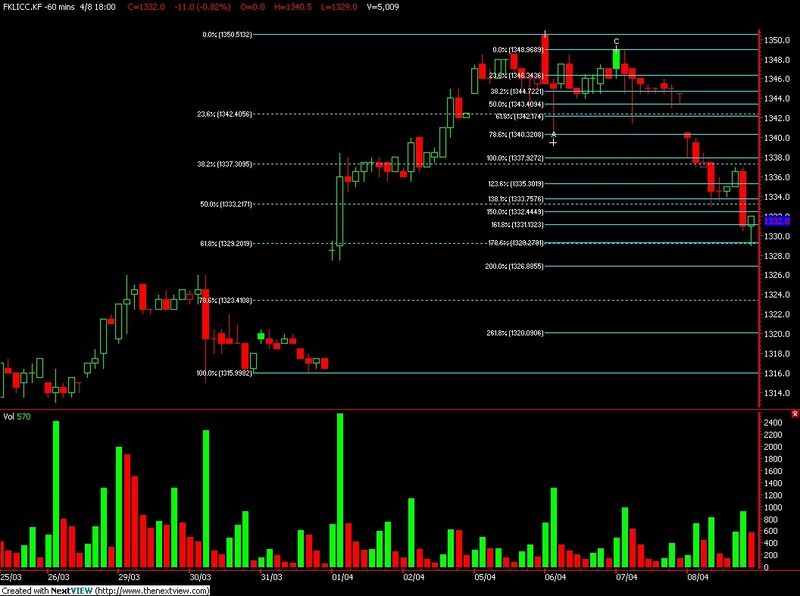 Technically, FKLI seem manage to penetrate previous high level at 1337 regions and ended trading sessions at 1242.5, 123.6% and 178.6% Fibonacci resistance levels. 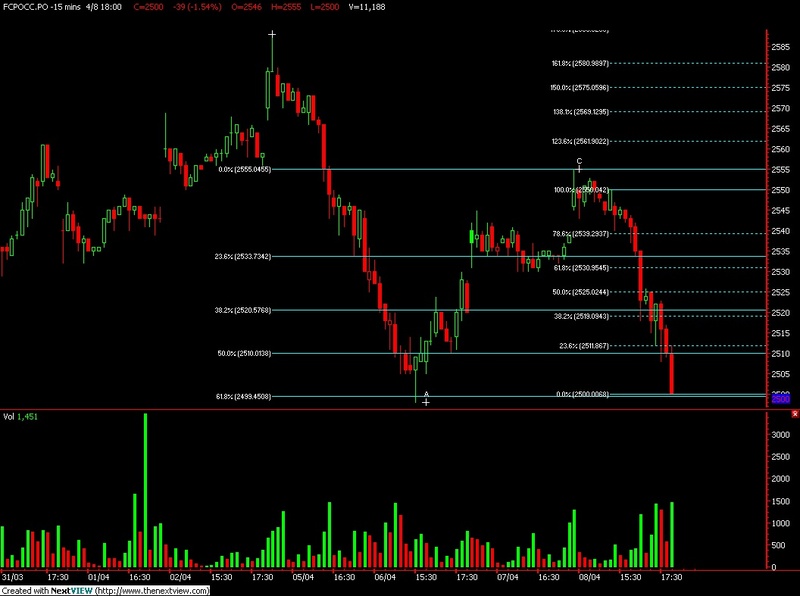 However, FKLI would encounter short term retrace provided support levels at 1335.5 and 1327 were violated in the coming trading sessions. 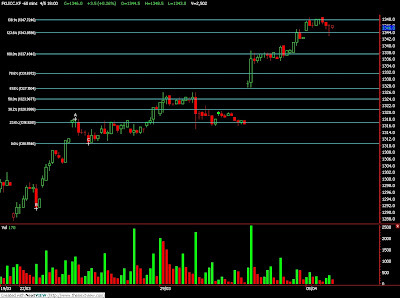 Resistance levels were seen at 1349 and1353.5 regions.